Whey protein is an excellent nutritional source of protein for maintaining skeletal muscle mass. It used to be a supplement that only bodybuilders took. Now, other athletes and people who exercise recreationally use whey protein for their post-workout shakes or juices. People have been using whey protein in recent years to get an extra boost during their workouts. Whey used to be a supplement that only bodybuilders took. Now, other athletes and people who exercise recreationally use whey protein for their post-workout shakes or juices. When dairy products are produced, milk proteins are separated into two yields, casein and whey. Curds are separated with casein by adding rennet or an acidic substance to make it clump. This step is necessary for cheese-making. The liquid part that is left after separating the curds is called whey. Whey protein contains all of the essential amino acids and is a complete protein. The three primary types of whey protein include the following: Whey protein concentrate, whey protein isolate, and whey protein hydrolysate. Each of these variations is used in nutritional supplements and for different purposes. 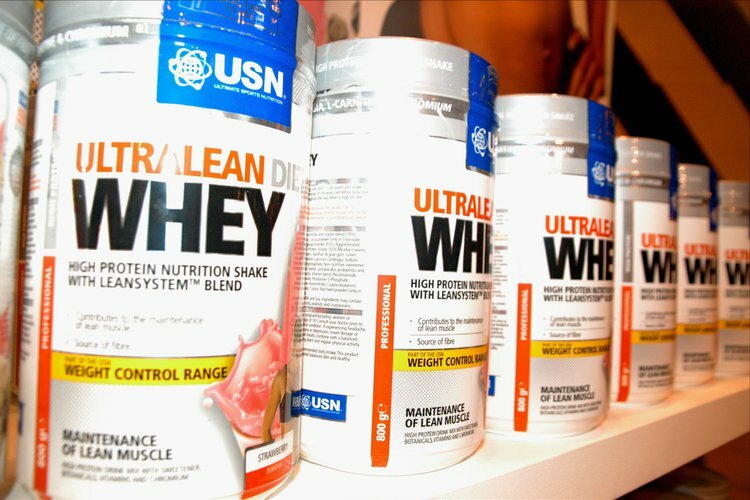 Whey protein concentrate has low levels of fat and lactose. The quality of whey protein concentrate determines how much protein it has. Lower quality concentrates usually have 30% protein, and higher quality can have up to 90%. Whey protein isolate is more processed than whey protein concentrate with the removal of all fat and lactose. Whey protein isolate contains at least 90% protein. Whey protein hydrolysate is thought to be the predigested form of whey protein because it already gone through partial hydrolysis. Hydrolysis is a necessary step in order to process the protein for absorption. Whey protein hydrolysate does not need as much breakdown as the other two forms of whey protein. This form is used for medicinal purposes as a protein supplement and in infant formulas because of its improved digestibility and reduced allergen potential. Whey protein is an excellent nutritional source of protein for maintaining skeletal muscle mass. Research, published in the International Journal of Sport Nutrition and Exercise Metabolism, suggests that resistance training with whey protein supplementation can provide some health benefits compared to resistance training alone. In addition, those who supplemented with whey protein had a relatively larger muscle in lean tissue mass. Those interested in weight loss and getting slim should look to whey protein. Another study from the International Journal of Sport Nutrition and Exercise Metabolism showed that males who used whey isolate provided significantly better improvements in strength, lean body mass, and a decrease in fat mass compared to individuals who used casein during a 10-week resistance training program. Another reason how whey protein helps reduce weight is that it reduces the individual’s appetite. Australian researchers from the Commonwealth Scientific and Industrial Research Organization investigated the taste responses of males when drinking four different beverages. They found that individuals who drank 50 grams of whey had lower hormone levels that reflect hunger than those who consumed the other drinks. Individuals with type 2 diabetes should talk to their doctor about whey protein supplementation with whey protein powder. Dr. Inger Bjorck and colleagues investigated how whey supplementation affects blood sugar and insulin levels. They concluded that adding whey to your meals with food that can usually spike blood sugar stimulated insulin release and decreased after-meal blood sugar jumps. A study in 2000 from the Anticancer Research Journal found promising results that whey protein concentrate exhibit anti-carcinogenesis and anticancer activity. Other studies from Cancer Letter suggested that whey protein diets result in increased glutathione (GSH) concentration in the body, which can help prevent cancer. However, there are some side effects to whey protein. Even though whey contains very small amounts of lactose, people who are allergic to milk should stay away from whey. In addition, too much whey supplementation could cause stomach pains, cramps, nausea, headache, and fatigue. Enjoy whey protein with your favorite morning drink by making it a protein shake. Many people add it to their fruit smoothies to gain a protein boost. Bounous, G., Batist, G., & Gold, P. (1991). Whey proteins in cancer prevention. Cancer letters, 57(2), 91-94. Bowen, J., Noakes, M., & Clifton, P. M. (2007). Appetite hormones and energy intake in obese men after consumption of fructose, glucose and whey protein beverages. International Journal of Obesity, 31(11), 1696-1703. Burke, D. C., & Chilibeck, P. D. (2001). Combined With Resistance Training on Lean Tissue Mass and Muscle Strength. International journal of sport nutrition and exercise metabolism, 11, 349-364. Cribb, P. J., Williams, A. D., Carey, M. F., & Hayes, A. (2006). The effect of whey isolate and resistance training on strength, body composition, and plasma glutamine. International journal of sport nutrition and exercise metabolism,16(5), 494. Frid, A. H., Nilsson, M., Holst, J. J., & Björck, I. M. (2005). Effect of whey on blood glucose and insulin responses to composite breakfast and lunch meals in type 2 diabetic subjects. The American journal of clinical nutrition, 82(1), 69-75. Yang, Y., Breen, L., Burd, N. A., Hector, A. J., Churchward-Venne, T. A., Josse, A. R., ... & Phillips, S. M. (2012). Resistance exercise enhances myofibrillar protein synthesis with graded intakes of whey protein in older men.British Journal of Nutrition, 108(10), 1780-1788. Tang, J. E., Moore, D. R., Kujbida, G. W., Tarnopolsky, M. A., & Phillips, S. M. (2009). Ingestion of whey hydrolysate, casein, or soy protein isolate: effects on mixed muscle protein synthesis at rest and following resistance exercise in young men. Journal of applied physiology, 107(3), 987-992. Keri Marshall, N. D. (2004). Therapeutic applications of whey protein.Alternative Medicine Review, 9(2), 136-156. Tipton, K. D., Elliott, T. A., Cree, M. G., Aarsland, A. A., Sanford, A. P., & Wolfe, R. R. (2007). Stimulation of net muscle protein synthesis by whey protein ingestion before and after exercise. American Journal of Physiology-Endocrinology and Metabolism, 292(1), E71-E76. Pennings, B., Boirie, Y., Senden, J. M., Gijsen, A. P., Kuipers, H., & van Loon, L. J. (2011). Whey protein stimulates postprandial muscle protein accretion more effectively than do casein and casein hydrolysate in older men. The American journal of clinical nutrition, 93(5), 997-1005. Foegeding, E. A., Davis, J. P., Doucet, D., & McGuffey, M. K. (2002). Advances in modifying and understanding whey protein functionality. Trends in Food Science & Technology, 13(5), 151-159.